When I look back on my experience I find this cartoon has a ring of truth. There were many verses of the Bible that I either didn’t realize existed (though that may seem strange) or that we just ignored. We virtually cut them out of the Bible in the sense that we ignored or reasoned them away. Other verses I just read with my “Baptist glasses” on and twisted them to fit my old tradition. One person told me, “There are some verses that don’t fit my theology so I just set them on the shelf. Looking back it makes me happier than ever to be a Catholic. The stuff you have written in your book shown below doesn’t make you any better. You are know trying to fit the Holy Scriptures to fit your ‘Catholic glasses”. You still stand condemned as ever before. STEVE RAY HERE: Francisco, you’re only proving my point with you above. We don’t add anything to the Scriptures I give a list of items below that the Bible says is required for salvation. These are versus you cut out, they are verses we read and include, salvation is not by faith alone solvation also includes a whole list of things that are required by God namely obedience. The list I gave only proves my point thanks for helping me do that. How does one receive salvation, justification, new birth and eternal life? By believing in Christ (Jn 3:16; Acts 16:31)? By the work of the Spirit (Jn 3:5; 2 Cor 3:6)? By works (Rom 2:6, 7; James 2:24)? By grace (Acts 15:11; Eph 2:8)? By perseverance (Matt 10:22; Mk 13:13; Col 1:22-23)? By his blood (Rom 5:9; Heb 9:22)? By His righteousness (Rom 5:17; 2 Pet 1:1)? By His cross (Eph 2:16; Col 2:14)? 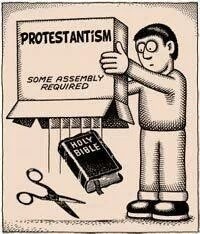 Roman Catholics are doing the same things as the cartoon. In fact the Roman Catholics I have encountered don’t know the Bible that well nor their catechism. Studies even show this. Tan, what does “know the Bible” mean to you? Love hearing you on the radio. I will be reading your book. I would like to see Tan give us some examples of his first sentence, and direct us to some of those “studies” in his last. I returned to the Catholic Church after being in a non denominational church for 37 years just a year and a half ago. I now feel my faith is complete and my parish feels like home. So often in those 37 years I would read the Bible and come upon verses that did not fit protestant theology. I would ignore them but new there was more to it. I’m thrilled to be home. Thanks to people like you, us Catholics who may have been poorly cathecised are learning more about our faith and I believe the Catholic Chutch may be in the middle of a dip but is now beginning to rise. Thanks to you and to many like you for helping to confirm the faith and to give answrrs for the most common questions out there. Jesus began with a tiny group in trying times… today we have freedom and I dont know it seems so hard to talk about the faitb (me personally) Thank you ! It’s okay to read the Bible through “Catholic glasses,” (meaning Catholic Sacred Tradition) because the Catholic Church is where the Bible came from. It’s *how* we can and should understand the Bible. ‘Knowing the Bible’ isn’t the same as knowing God. We can only STRIVE to know God. This we do by doing His will, by trying to be the sheep, not the goats on the day of judgement. Most Catholic youths make confirmation, and and with that, their spiritual schooling starts it’s decline- not an increased growth. Sure the Gospels are with us every Sunday, but for many, the noise of the modern world blots out the ability to live and learn God’s word in a very much needed relevant way. Just as we may scoff at the one time Protestant “Saved” get out of jail free card process- I see it all too often where people are lacking the discipline to live their Catholic faith, and that has to come from a deeper understanding of the books in the bible as well as the fulfillment of the Eucharist through Mass. Even the celebration of our Saints- those who have shown us the Grace of God on this earth are overlooked and unappreciated anymore. Most Catholic youth only know the Secular version of the Life of Mother Teresa- without ever learning of the true prayerful meaning of her magnificence should guide us with. We always need to know our faith in a Deeper way, as those depths are boundless- and contain a richness of purity, and a beauty of life that are not able to be found anywhere else in this world. We sorely need some…Catholic Continuing Education. On one hand, I firmly believe Catholics should know their Bible better. On the other hand, salvation calls for us to know Jesus–not the Bible itself. The Bible is the best tool to learn about Jesus from the people who knew him. However, nothing says that God will give us a scripture test or require us to memorize scripture verses. I think Protestants fail to see this nuance, but Jesus himself said, “You study the Scriptures diligently because you think that in them you have eternal life. These are the very Scriptures that testify about me, yet you refuse to come to me to have life.” John 5:39. In other words, the whole point of scripture is to bring you closer to Jesus; the Bible can’t be an end unto itself. What most of common catholic knows about Catholic faith is just the ‘tip of the ice berg’ beneath it is so vast and beautiful. We need to swim below (study) so we can see the truth. Previous post: From Israel to Italy Today; Troublesome Muslims there too; Urinating on Mary; Wake up America!